Arguably the standout feature at 'LEM' is the arrival of Lombok's first ever movie theatre complex. For Indonesians the shopping mall is much more than merely a place to spend money in air-conditioned comfort. It is a destination in itself; a place to socialise, meet and mingle. 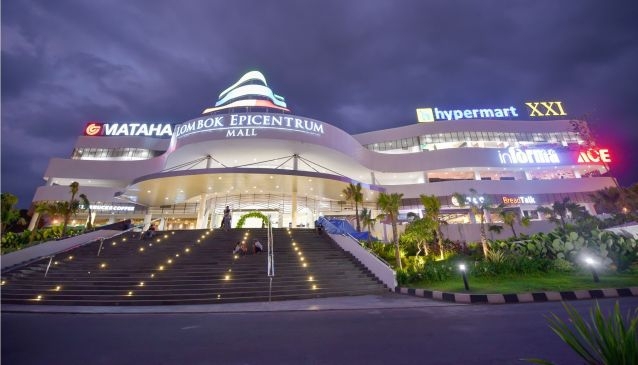 Lombok’s latest swanky shopping centre Epicentrum Mall finally opened for business late last year and has proved an instant hit with local city dwellers. It is a huge four-storey building that you simply won’t fail to miss driving along Jalan Sriwijaya, particularly after dark when it is illuminated with bright neon lights. Mataram Mall, for so long the solitary shopping centre in central Mataram, has now got some serious competition. Lombok Epicentrum Mall (LEM) has a similar design template to the numerous urban malls found throughout Jakarta with a sprawling open plan ground floor flanked by boutique stores and escalators leading to other floors. This is where varied entertainment takes place on a regular basis and in its short history so far has hosted talent shows, cultural performances and live music. The mall has several big anchor stores such as a Matahari department store and a large Hypermart supermarket. Other notable retailers include Ace Harware and an Informa furniture showroom. There is also a full complement of fashion boutiques, sportswear, shoes, homewares, electronics and gifts to browse. Arguably the standout feature at ‘LEM’ is the arrival of Lombok’s first ever movie theatre complex run by Cinema XXI, Indonesia’s biggest cinema chain. It has regular screenings of children’s movies affording at least one parent an escape to get in some serious unhindered shopping. Another kid-pleaser is the perpetually busy Timezone amusement arcade which has all the requisite hi-tech video games and even fairground-style bumper cars. Shopping on this scale is hungry work but thankfully, there are numerous places to take a break for a bite to eat. The lower level features a raft of small eateries and deli-style cafes alongside familiar names such as KFC, Starbucks, J&Co and Bread Talk. The mall is well designed, allowing for the easy flow of people, and never feels overcrowded even on the busiest days. It’s still not the finished article yet with many units still being prepped for new tenants to move in. Traffic in an out of the mall also flows remarkably well for Lombok standards and there is ample parking space for hundreds of vehicles. While spending a few hours in a shopping mall is not everybody’s idea of fun during a tropical holiday, it offers some much need respite from the heat and is a great way to experience modern city life while picking up a few bargains. Kids will also be intrigued to learn Epicentrum Mall is also invitingly close to the KuraKura aqua park.